*The infant death rate is defined as the number of deaths of children under one year of age, expressed per 1 000 live births. Some of the international variation in infant death rates is due to variations among countries in registering practices for premature infants. The United States and Canada are two countries which register a much higher proportion of babies weighing less than 500g, with low odds of survival, resulting in higher reported infant death. In Europe, several countries apply a minimum gestational age of 22 weeks (or a birth weight threshold of 500g) for babies to be registered as live births. **Except Canada, Japan, New Zealand: 2012; USA, Chile: 2013. Source: CICH graphic created using data adapted from OECD (2017), Infant mortality rates (indicator). doi: 10.1787/83dea506-en. https://data.oecd.org/healthstat/infant-mortality-rates.htm – accessed June 21, 2017. 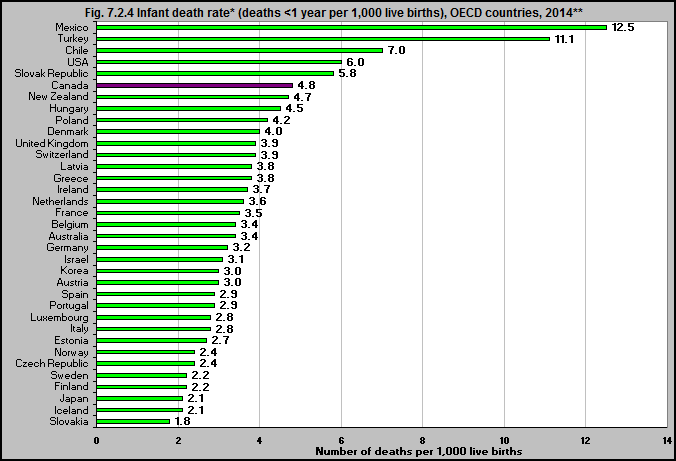 In 2014, Canada ranked 30 out of 35 OECD countries in terms of the infant death rate. Canada’s infant death rate was 4.8 per 1,000 live births. Infant death is considered a sentinel indicator of child health and societal well-being over time. It is considered a reflection of the economic and social conditions for the health of mothers and babies, as well as health system effectiveness.1 It also reflects health disparities between different groups within countries.1 In 2005, the United Nations’ stated: “No indicator captures the divergence in human development opportunity more powerfully than child mortality.”2 Although Canada’s infant death rates have declined, other countries have done better. Many peer countries have infant death rates considerably lower than Canada’s. Therefore we could try to better understand these differences – whether they are due to issues related to the way data are collected and reported or socio-economic conditions and inequalities – or both. 1Organisation for Economic Co-operation and Development, OECD Factbook 2009: Economic, Environmental and Social Statistics (Paris: OECD, 2009).http://www.oecd-ilibrary.org/economics/oecd-factbook-2009_factbook-2009-en – accessed June 21, 2017. 2United Nations, Human Development Report 2005 (New York: UNDP, 2005). http://hdr.undp.org/sites/default/files/reports/266/hdr05_complete.pdf – accessed June 21, 2017.